There is a mental health issue spawned by Facebook called FOMO. Fear of Missing Out. FOMO is a serious condition. Do you know the signs? Matt Cutts, the SEO guru and spam assassin at Google, recently asked if SEO (search engine optimization) should be called something else. (1) We should not optimize (improve to achieve the best possible condition) a website primarily for search engines, but for human users and search engines. You've seen it frequently on Facebook: somebody complaining or freaking out over something that isn't working right. A feature that suddenly vanished. The inability to post a comment, or a reply on a comment. Often the person expresses high frustration and exasperation. Since Facebook works in an expected and routine manner most of the time, when something goes wrong, we may think it "means" something -- something bad. Are we being punished? 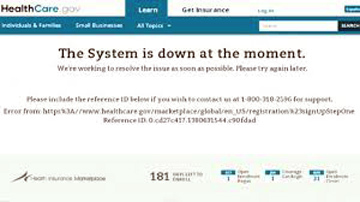 The Obamacare website is a usability nightmare. Like many companies with complex, high traffic websites the developers must have not conducted adequate user observation tests or functionality checks. Although server overload is the primary problem, various aspects of the site are broken. Web developers should watch and learn from this unfortunate situation. Email is not "Broken" -- It's just "User Error"
Have you noticed all the tech articles that rant about how email is "broken"? I've never been able to understand all the whining and complaining about how bad email is. It's called "a relic of a bygone Internet era." Crammed email inboxes are blamed as sources of great stress and frustration. Converting an automobile into an internet connected workstation is a bad idea. Texting while driving is becoming illegal in many states and some have a ban on any type of cell phone use by novice drivers and school bus drivers.